TAILORED CLASSIC FIT: This chef coat/jacket is men styled and fitted for durability and comfort ensuring this coat works as hard as you do without the hassle. This coat features long sleeves and turnback cuffs, pearl buttons, reversible front closure, a chest and thermometer sleeve pockets, and a tailored fit creating a look that doesn't get any more professional than this chef coat. GREAT QUALITY: This coat is made of a premium blend of breathable 65% polyester and 35% cotton that feels great and look good. These are made with food service professionals in mind. This coat can be easily embroidered or imprinted on with your name, custom designs, business logos, be used as promotional items, and much more. 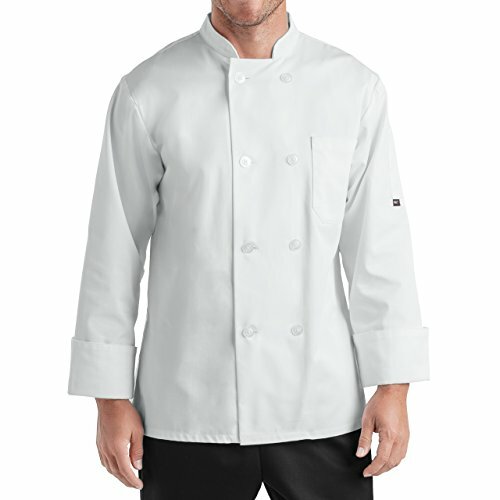 EXCELLENT VALUE: This Men's Long Sleeve Double Breasted Chef Coat is comfort, quality and value, all bundled in one. Chefs, Line Cooks, Caterers, Counter Servers, Expediters, Directors, Managers, Students, and much more; all find this coat affordably priced and available in a wide range of sizes perfect for all food industry professionals. Click 'Add to Cart' now to join the list of satisfied buyers!